I have posted this recipe before, here's the original post. 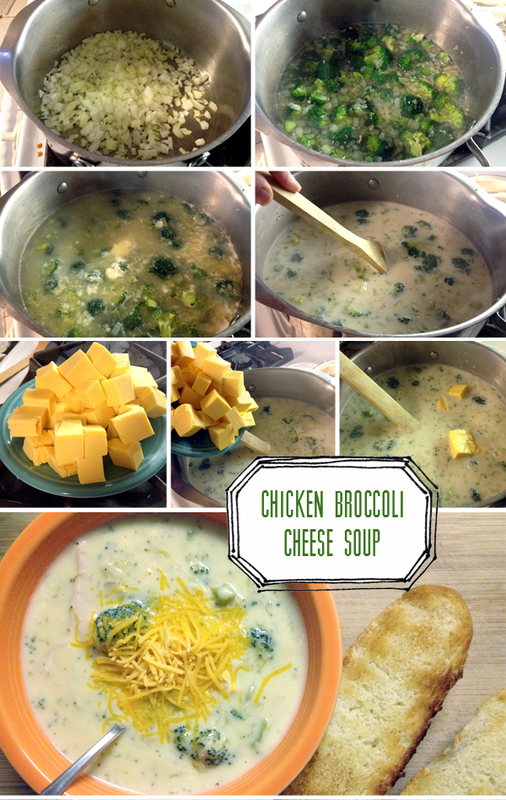 This is one of my favorite cold weather soups. MMM. Cheesy goodness. It's also a great way to use your homemade broth from this post, and the chicken too! extra shredded, cheddar cheese to top it - completely optional but who doesn't love more cheese? Heat oil in a large pot, add onion and cook until tender then add garlic and saute about 5 minutes. Add chicken broth, chicken and broccoli. Bring to a boil over medium heat. Reduce heat to medium and cook 10 minutes. In a separate bowl, combine milk and flour and whisk until well blended. Add milk mixture to pot and cook 5 minutes - stirring constantly until slightly thickened. Stir in pepper and cheese. Continue stirring until cheese is melted, about another 5 minutes. Pour into bowls and enjoy. Whatever you don't eat you can freeze. Did I mention how easy, fast and delicious it is??? Had to pin this one. Thanks for sharing!